It's miserable getting your nice warm gloves soaked through on your commute to work and having to ride home with cold gloves, still soaking. Various bike store sales people have told me that "there's no such thing as waterproof". Fine. But could that really be true? I couldn't imagine this to really be the case. So I asked one of my trusty email lists (internet-BOB) and got a range of replies from all over the world. 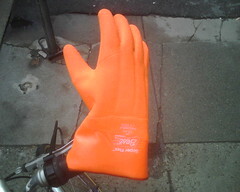 One kind soul who lives nearby emailed me off-list to say that he has a pair of completely waterproof fisherman's gloves that he'd sell me cheap. So we met in Davis Square this morning and did the deal. Had a very nice chat, too! Very likeable fellow. The gloves (as this photo clearly shows) are utterly and completely waterproof, but perhaps not suited to stuffing cotton into little bottles and the like. It was a great start to the day (which also happens to be a gorgeous 58 degrees! ), after which I found a nice reflective trouser band in the street! Not many people on either path, so it was really lovely. Lots of leaves, and I took care not to go slip-sliding away, but I never really lost my footing at any point. 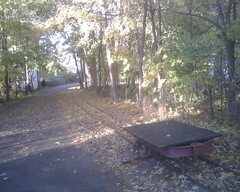 The real surprise was the second path, which picks up very near the Bedford end of the Minuteman path, across Loomis Street. It even has a bit of the old track at the start. The surface starts fully paved, then it turns to packed gravel, much like many of the Sustrans routes in the UK. Again, lots of leaves, but the surface was generally very good, allowing me to truck along at 17mph for most of its length. I turned around at Fawn Lake (which warrants further exploration another time), which turned out to be precisely 10 miles from home. Old Thorny performed exceptionally as usual, reminding me that it really is worthy of the odd off-road adventure. About 35 miles ago, my cyclometer ticked over 1000 miles! Doesn't qualify me for Paris-Brest-Paris, but still, it's probably a record for me for I don't know how long. As it gets colder, I wonder how I'll stay in shape. And Boston too. I briefly considered taking public transport in today, but changed my mind because it's supposed to be really nice later today, and I didn't want to get stuck on the T with viruses running rampant (everyone I know seems to be deathly ill right now). I bundled up a little excessively, going with fleecy mid-layers instead of wool, because synthetics should dry out quicker. It was a light but steady rain all the way here, and I do think my Gore Tex outer layers let some water through. According to my queries at local bike shops and in email groups, the thing to do is to wash and dry all of it, which should rejuvinate everything. There's also a product called Nikwax, which lots of people like. I'll give it a go without first. I took the scenic route today (bike path from Arlington to Cambridge via Alewife, then along the river), and made a big discovery on the top end. To get from Pleasant Street in Arlington to the bike path, I'd always gone all the way down to Mass Ave and then cut in at what used to be Carberry's bakery. But today it occurred to me to turn off Pleasant Street and follow signs to the Boys & Girl's club, then ride along the path by Spy Pond and join the bike path a little later. That's a much, much better route, allowing me to avoid the whole right turn on arrow only nonsense of that intersection and also cut out a goodly part of (un)Pleasant Street! This was also a nice test today for my Ortlieb trunk box - it kept my change of clothes bone dry! Early November, and it's well and truly Autumn in Boston. Many of our trees are still green, others are completely naked, but most are a bit colorful and somewhere in between. The weather is finally perfectly chilly and clear by and large, with 30s in the morning and 40s-50s later on. Perfect weather for biking, in other words! My birthday wool jersey is now a staple, and I can wear it almost everyday without getting all stinky (of course, I air it out at the office during the day and also overnight at home). It's from Earth Wind & Rider. I also have a nice wool beanie from Kucharik, and I have some wool tights from them on the way. Of course, the time change last week means that I'm riding in the dark a lot more, but it's not a big deal, really. I tend to keep to Mass Ave on the way home if it's really dark... for some reason I feel like that's going to be safer than heading up Broadway via Davis Square because there's MORE traffic and cars are necessarily slower. More bikers too. The nice thing is that, while I haven't really managed much weekend riding because there's just so much fun stuff to do with the family, I've been averaging three to four days of commuting by bike each week, putting my weekly mileage between 60 and 75 - not bad! I've also been thinking about how I'll keep in shape when the snow starts falling... should I try snow-shoeing or XC skiing? Jury's still out. Those would still be weekend pursuits, though, but I'm going to try walking to Alewife for my commute, which is about 3 miles each way, I think. And that should be much easier now that the bike path will be plowed, at least part of the time! Did a beautiful ride this morning from the Rubel Pocket Rides series. From "Beyond the Minuteman Bikeway, Bedford", no. 10 is "The Watertower Ride", featuring our own water tower here in Arlington Heights. It's listed as a 32-mile ride, but I cut a couple miles off by riding up the bike path to the Bedford end, where the ride officially starts. On the bit that I cut out, there seems to be lots of twisty-turny-ness that I see little point to. Perhaps its a nice alternative to the bike path, which I guess could grow monotonous for some. The bike path was ideal for me when I set off around 6:30 since it wasn't quite light enough to see my queue sheet! In any case, the weather was perfect early Autumn weather - leaves just beginning to fall, mid-40s and clear. The route is wonderful because it takes in beautiful countryside and also lots of genuine points of interest, like the Old North Bridge, Concord River (2 crossings), Walden Pond, and the Decordova museum. The other really nice thing about this ride is that it's easy to navigate - not more than 4 or so major turnings if you do it like I did. When the map indicates turning on "River Street", it's actually "River Road" - when there so many possible permutations of streets, avenues, ways, and paths, it's important to get that right. Heading into Belmont, there's a steep descent that the route description says is lots of fun, providing that you be prepared to stop at the bottom. In fact, it's quite a treacherous hill, particularly when the sun is coming up and the sun's in your eyes. While nearby Pleasant Street has been completely repaved, this bit hasn't been so lucky, and there are some VERY significant bumps on the way down. I hit a couple of them really hard and only quite managed to keep my hands on the bars because I was gripping them for dear life and not bothering to touch the brake levers. Which is why the sharp right-hand turn came as an unwelcome surprise and nearly sent me into oncoming traffic; there's also the possibility of going over the barrier on the other side if you really go wrong. On the bright side, that little brush with my own mortality gave me the boost of adrenaline I needed to power back up the hill to the water tower before heading home. Cyclofiend is a fun site with pictures of people's bikes. Here's the entry about our Christiania. I'm not sure where the name of this blog comes from, but it's a very interesting site nevertheless, all about internally-geared bike hubs. (Which describes the gearing all of my bikes - the Fahrrad Manufaktur, the Thorn Raven, and the Christiania trike). One very interesting recent post is about a new Rohloff hub with greater range, smaller size, and less weight. It's not as disasterous as all that, I just have a flat and no means to fix it. I should have seen it coming. I've had a slow leak in front for weeks now, and it's only meant that I need to top up before I head out. Today, though, I thought I felt a little low but I set off regardless since I was running a little late. But by the time I set off from South Street, it was pretty soft. I considered asking the gang of bike couriers I alway pass by at their financial district hangout if I could borrow a pump, but I didn't think it was a necessity then, and, sure, they're also pretty intimidating. Especially in large numbers, at leisure. So I kept going. I bottomed out near Kendall Square, and I think I probably got a snake bite puncture, and from there, the end came swiftly. I resolved to taking it on the Red Line to Alewife, locking up, taking a taxi, and returning with the car. But then Jim called and now the girls are coming to get me and the pizza I've ordered from Emma's' which I've alway wanted to try! I also squeezed in a quick beer at Tommy Doyle's' which certainly helps take some of the disaster out of it all. Here's our Christiania unladen. See more photos here. Whenever we venture out in the Christiania trike, we get lots of stares and curious questioners. Here are answers to some of the questions we get most often. Can I have a closer look? Sure! Here's a bunch of photos. I'm happy to arrange to meet in Boston with anyone interested. I'm afraid not. It was built by hand in Denmark by a small company called Christiania, after the commune settlement in Copenhagen where the company was founded (and based for a long time - but they've now moved, and the settlement is under threat from the government). See the Christiania Bikes website for more information (and some photos of us!) or this page for all the specs. I feel very safe riding it, and I have no reservations about riding with my two small daughters. The construction of the trike is very, very solid. The box is thick plywood, and the rest of the bike is steel, with very good quality components throughout. 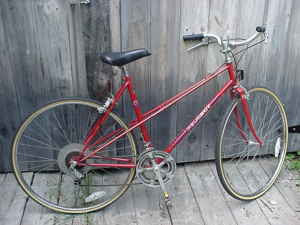 It has a coaster brake on the rear wheel and discs on the front wheels. There's a lap belt for older kids (like my 3 1/2 year old), and a three-point harness for younger kids (like my 14-month old) - these mechanisms probably aren't compliant with US safety standards, but I don't have any problem with them. The other day, I popped into The Bike Stop on the bike path in Arlington and created a bit of sensation - and one one of the staff asked me to take his sister and her friend for a ride. Why not? When they emerged from the shop, it turned out that they were 7 and 9, and a little chubby... but we still had a nice ride and the bike handled perfectly well. The maximum weight recommended by Christiania is 100kg, or about 220lbs. I've carried all sorts of stuff, including children, dogs, groceries, rubbish, and a big portable PA system. What else can you do with a Christiania trike? They aren't only good for schlepping kids around town, though they are great for that. Since they're all built to the customer's specifications, they can do lots of things, including carrying up to six kids, I think. In London (and elsewhere), they're used in their purest form as courier and delivery bikes. The big box and 100kg capacity is definitely a couple steps above what your average courier on a fixed-gear bike can do! This would also be the ideal vehicle (even in Boston with the harsh winters) as an alternative to a car. For journeys of six or seven miles, it's perfectly comfortable with any sort of load; I loved doing all the shopping in London with ours. And aside from the practical appeal, it makes a great statement! If you're in Denmark, you'll have no problem, since you already see them everywhere. We bought ours in London, from the wonderful shop Velorution. They're very helpful, and they have all sorts of Euro utility bikes and elements of bike culture. If you're in the US, you're pretty much out of luck right now. Christiania does not export to the US, so the only way to get one over here is to buy in Europe and bring back as we did. Having said that, I am considering importing Christiania trikes. If you might be interested in buying one, please post a comment. You bedda watch weah YAH goin! That's no surprise! This was big in the news yesterday after a new report was released. My latest encounter with Boston's Rudest was just yesterday. After crossing into Boston over the Longfellow Bridge, I was cut off by a glass installer's truck. I came alongside and in a shocking display of bravado shouted "Are you trying to kill me? You better watch where you're going, buddy!" Did that come out of me? He immediately fired back "F--- You! You bedda watch weah YAH goin!" Touche, I guess. I vowed to be calmer about these things in the future. There were supposed to be a total of three cyclists' breakfasts on my way to work today. First Alewife, where I planned to be at 7:00... but nothing. I looked around a bit, I couldn't find anything at all. Next stop was Broadway Bicycle, where I was among the first arrivals for the 7:30 Pancake Breakfast. They were a little late getting going, but we had a nice social time chatting at the table over coffee. Turns out another chap won a complete fixed gear bike at the Redbones thing last night! It's Bike Week in Boston! 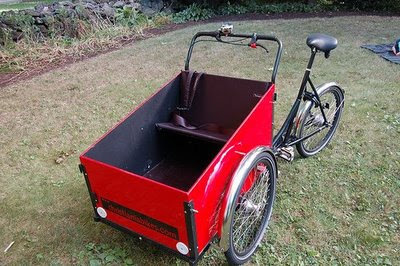 Last night, we Gemma loaded into the Christiania and headed to the big Redbones BBQ kickoff party in Davis Square. On the way, we met Lauren and her famiglia, and we rode down together along the bike path. How nice to have a virtually uninterrupted traffic-free route to the party! The Bike Festival (as Gem called it) was fun, and the Christiania got lots of attention. For $15, we got a Redbones BBQ sandwich, a drink, and some condiments. Plus a lottery ticket. We had fun looking at the exotic utility bikes (like ones by ANT, and all manner of cool fixies. We also had fun petting a very small dog that came on the back of a nice lady's recumbent. There was also a big brass and percussion band which made up for its lack of musicality with volume and enthusiasm. We left at around 6:45 as Gem started to wane, and gave Lauren our raffle ticket just in case. And this morning, I had an email from her telling me that I won a fixed gear wheel from Paramount Bicycle in Somerville! Very exciting! I picked it up from the Ciclismo Classico office this afternoon and emailed the shop to find out what it would take to completely convert my $40 Schwinn World. Hooray! Another project! Since I embarked on the this project to restore an old mixte for Kim, bikes have been coming out of the woodwork. I've now got an old Schwinn (great for parts, particularly the center-pull Wienmann brakes), and a rather rusty old Motobecane. May come across another today. The one I have already seems to be a mid-1970s standard model; no quick release wheels, and steel rims with "go-slower" holes in the sides of the rims. The highlight seems to be the Motobecane-branded crankset and various other small parts. Seems to ride okay, though! My research seems to indicate that a Grand Touring or Grand Jubilee would fit the bill precisely, as long as it's not too scratched or rusty. From what I've seen, it seems that old European bikes hold their finish less ably than certain Japanese ones - many of the Fujis and Nishikis I've come across are flawless. What will I uncover today? After a meeting at the Seaport the other day, I decided to stop by the new ICA for a bit of lunch. The building was gorgeous as I expected, but lunch was rubbish. Equally disappointing was the bike parking - completely inadequate and a long walk from the entrance. And while the building itself looks nice from this angle (or from the sea), if approaching from the Seaport or from the Channel, it appears to be surrounded by a solid parking lot bounded by a low chain link fence. Had a nice after-work bike ride yesterday with the whole family, and Elsie's first time in Gem's old front-mounted Bobike seat. She seemed to have a really nice time, talking and smiling the whole way. We also didn't have any trouble finding a relatively flat network of roads in the neighborhood for a leisurely half-hour ride. First big ride of the year! Today was the first really REALLY good biking day of the year. For the occasion, I fitted our new(ish) Bobike Maxi seat to the back of my Fahrrad T100. I'd taken the fittings off my Raven weeks ago, but putting them on the Fahrrad was pretty easy. It actually works much better on this bike for some reason... there's less clearance between the cargo rack and the seat, but there's also really no way for Gem to get her foot near the spinning wheel. That was one concern on the other bike, probably owing to the 26-inch wheels. So we rode down to the bike path and went nearly all the way to Bedford before turning around and heading back. We had a nice picnic lunch in Lexington Center; we got a PB&J and a roast beef sandwich, and Gem ended up eating all the roast beef. We also got a couple home-baked cookies from Girl Scouts at Lexington Depot. I couldn't have asked for a nicer day or a nicer outing (only having the rest of my girls along would have made it better). I was also really pleased with the new bike seat! Gem found it to be very comfortable, she kept her feet in the footrests, and she seemed to have plenty of space back there. The only trouble is that it leaves little room for cargo, so I may look into front low-riders, but a good bar bag is probably going to be the way to go. I'll write more about the Maxi after we've ridden with it for a while. Took both of the Fahrrads in to the Broadway Bicycle School in Cambridge today. The shop had been recommended to me by my friend Kathleen, who bought a refurbed 1950s Raleigh there. It's a coop, and everyone there is exceedingly friendly and helpful. On a less busy day, I can go in there and pay a couple bucks for coaching on doing my own repairs! Very handy. Probably the least condescending bike shop I've experienced. So they do an estimate while you're there, so you know the score before you leave the bike - also very helpful. It'll take them until April 11th to do the work, but that's okay. They're also willing to have a look over the Christiania, but that will require some advance planning since they can't get it down the stairs, and it takes up lots of floor space. With the girls away, I spent most of the day out on a lovely ride today. 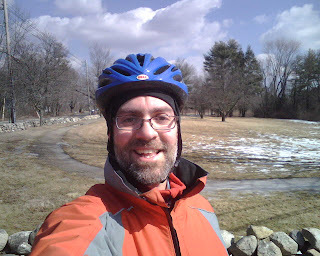 Instead of making my own way, I followed a 40-mile route from the Pocket Rides ride pack "Beyond the Minuteman Bikeway - Arlington". The ride took me out through Belmont, Lincoln, Lexington, and neighboring areas. It wasn't quite as countrified as I usually like, but most of the streets were lightly trafficked and pleasant. Lots of big houses, old and new. I got pretty hungry after 30 miles... I'd been looking for a snack spot for ages, but there was nothing! I suppose I could have ventured off the path if I'd gotten desperate. But in the end, I took a little detour in Lincoln to the wonderful Decordova Sculpture Park, where I got a nice tuna wrap at the cafe and ate outside amongst the art works. Also had some good Fritos, pictured above. A couple other notables about today's ride. It was my first ride in my new Rapha knickers, which performed admirably! I've wanted some for ages, and they're actually cheaper here than in London, where they're made. That's rip-off Britain for you, I suppose. In any case, I was looking for a new pair of 3/4-length bib tights and these were about the same price, so I got em! Real nice, real comfortable, and not Lycra-loutish at all. Also, I replaced my brake pads & shoes this morning, which is probably my most ambitious DIY repair yet. It took some doing, but they new pads are definitely a big improvement. After weeks of icy and sub-zero weather, today, Sunday, is approaching 50f and nice and sunny. And a perfect day for a ride! I packed up my little repair kit, bundled up as if the temperature could drop 30 degrees before lunch, and set off for Concord. I stuck to Route 2A pretty much the whole time, which took me through Lexington and into Minuteman Historical Park (site of the start of the Revolution) just after crossing 95. The ride from then on was beautiful, with lots of historical sites, perfectly preserved Colonial houses, and leafless trees, fields, and farms on both sides of the road. There's also a 5-mile unpaved bike path through the park that we can do once the weather improves. I continued into the center of Concord and picked up a bagel with peanut butter to fortify me for the ride home. The day and the route were also perfectly suited to my bike, with its bullet-proof wheels, grippy fat tires, and mudguards; I don't know how many riders I passed with skinny wheels and muddy stripes up their backs! I look forward to doing this ride and variations lots more. up a nice Rivendell cycling cap. uprights, but they were gorgeous and fascinating to see anyway. lots of the after-market hubs, and that they run around $1400! they're going to build it up as a Rohloff demo bike, which make sense. and when I've got one of my bikes with me. I'd like to begin by saying how much I enjoy Adventure Cyclist magazine; the features are always interesting and well-written. It's particularly good to features by venerable cycling writers like John Schubert, who I always enjoyed reading during another bike magazine's hay day in the 1970s and early 80s. I do believe, however, that Mr. Schubert may have missed a category of touring bike in his otherwise excellent article "What Kind of Bike Should You Buy?" in the February 2007 issue. While there are situations that call for a fully-loaded mountain bike on tour, it seems to me that a serious off-road long-distance cycle tourist would be best suited with an "expedition bike". 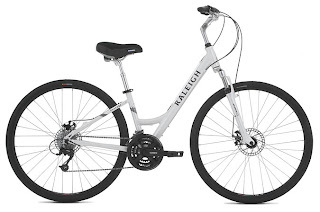 With a steel frame, 26-inch wheels, wide rims, and either dropped handlebars or straights, these bikes are designed for navigating rough terrain and carrying heavy loads with aplomb - there's really no need to use a mountain bike that's been expressly designed for another purpose. The expedition bike makers with which I'm familiar are all English: Thorn (a large selection from St. John Street Cycles; Roberts (the Rough Stuff); and Orbit (the Expedition). I ride a Thorn Raven Adventure Tour, which is equally well-suited to road and unpaved surfaces (I especially appreciate it in the winter months as road conditions deteriorate). This is one of Thorn's many models designed around a Rohloff hub, another wonderful product that you might consider mentioning in future buying guides. They're growing in popularity, thanks in large part to Thorn's efforts, but mainly because more and more people are falling in love with their versatility, simplicity, ease of use, and low maintenance. I believe that your readers would find some mention of the expedition bike category of interest, and I also think they could benefit from coverage of the Rohloff phenomenon. As I've been riding around so bundled up, I've also stopped worrying about my cleats, and have just worn my Gore Tex hiking boots with heavy socks instead. Not bad! For urban riding I've had no problems at all with regular shoes. Makes me glad I got the double-sided pedals! I've ridden in to the office in the Financial District several times. It can be a very nice ride from Arlington, taking in the Minuteman path to Davis Square, then to Inman Square, Kendall Square, and to Boston via the Longfellow Bridge, then on to the South Station area. It somehow seems a more serious affair when braving sub-zero windchill temperatures, and taking a shower on arrival. That's something I've never really done because neither the facilities nor the need have existed for me before. But let's face it: I am in no kind of shape to see clients after a 12-mile ride, drenched in my own sweat under layers of fleece and Gore Tex. So I worked on Sunday last weekend and tested out the facilities. The building is a new build out, and there is thankfully a little shower room on the second floor. For what it is, it's really quite nice: two showers and 12 or so lockers, with keys available from Security downstairs for the day. I anticipate it'll mostly be lunchtime joggers who use it, though. The company does little to promote cycling. The bike rack accommodates maybe 16 bikes in a pinch, and it's located in an alley behind the building, adjacent to the smoking area and shuttle bus stop. Doesn't leave much question about how the company regards cyclists, does it? But as far as I'm concerned, it suits me well. The ride is very pleasant, and just the right length to get a nice little workout. One of these days, I'll put my campaigning hat back on and see about getting these guys to encourage more cycling. With Gem's cousin visiting, we had a lovely ride from Arlington Heights along the bike path to the playground at Spy Pond. I had an email from someone recently who saw my thing about the Bobike seat, asking what kind of bike Kim rides. 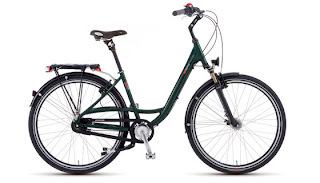 It's a VSF Fahrrad Manufaktur, and it's a perfect bike for riding around town. 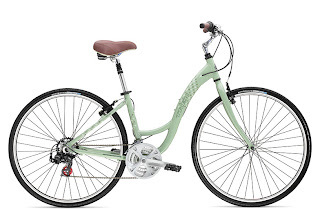 Step-through frame, basket, lights, mudguards, very strong and robust (only it is a bit heavy). We'd heartily recommend it to anyone - the only trouble is, they're only available in Germany (where they're made) andn in London through Bikefix. A couple years ago, crapola Bicycling Magazine declared a revolution in the making, in the form of Joe Breeze's Breezer town bikes. They thought it was revolutionary to offer a comfortable, upright bike with a step-through frame, basket, lights, mudguards... when, of course they've been riding these sorts of things in Europe for years. In any case it's nice to see that other US manufacturers are finally catching on. Here are a handful of bikes that seem to be made from a similar mold - from Breezer Bikes, Raleigh USA, Trek, and VSF. I was about to put some air in the tires of my Christiania today, and when I unscrewed the little cover on the valve, I wasn't quite sure what I was looking at. The valve looked like a larger Presta valve, only without the little screw stalk in the middle. A quick Google search revealed that it's a "Woods" or "Dunlop" valve. Very strange indeed. According to Sheldon Brown, they're "very rarely seen in the U.S." He also says that they my Presta pump ought to do the trick on them, which is good news! Here's a photo from Sheldon's site. We spotted lots of these around Midtown, though not many with passengers. Got into an interesting debate with the family about whether it's safe to use these things... Amy said she'd never let her kids in one, and Kim and I both said "why not?" The real question, I guess, is whether NYC drivers are any more mindful of pedicabs than they are of regular cyclists.